Nestled along the country roads of Lancaster County, Pennsylvania, the Amish still cherish and cultivate the virtues realized by living a plain and simple life. In this collection of four complete novels, bestselling author Wanda E. Brunstetter transports readers to this secluded corner of rural America and provides a refreshing glimpse into a culture noted for its hard-working, family-oriented people of strong religious faith. Despite their horse-and-buggy pace in a high-speed world, when it comes to romance, the Amish find their hearts racing at top speed. 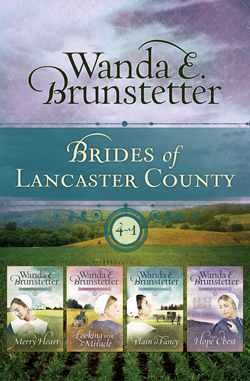 The Brides of Lancaster County tells the stories of four Amish young adults as they explore their place in the world—while finding true love in the process.